Part I of this message focused on giving and covered the timeless truth that it is better to give than receive. Part II of this message will address the aspect of Receiving as a key aspect to help build and strength our character. We all enjoy receiving a thoughtful gift from loved ones during the holidays or other special occasions. We may feel a slight sense of concern and express “you really did not have to do that”, but we all have little to no struggle in receiving a gift around these special events. However, like many aspects of building and strengthening our character, I want to address an area where many of us struggle and that is in Receiving help from someone who is genuinely wanting to give some assistance. In my learnings from the observations of others, research on the subject, and reflecting on my personal choices through the years, there is a tendency for many of us to resist receiving help, even when we clearly need it, and we choose to continue struggling on our own in trying to complete the task or address the situation. In the workplace, it is quite common to observe individuals struggling to complete a task or key deliverable and when the offer from others to help comes around, the response is usually, “thanks, but I have this one covered.” I can recall having the same response myself even though I was really struggling to complete a task. In a work situation, many times we do not want to appear that we don’t have the skills to deliver on a task. In addition, we have the desire to demonstrate we can handle a tough assignment. Regardless of the reason, refusing help when needed puts us in an extremely stressful situation that has unintended consequences that go beyond the specific project. It is not just the workplace where this “go it alone” decision persists. We see the same choices on the home front when struggles occur with raising children, holding a marriage together, or dealing with aging parents. When these problems are clearly visible to others and the offer to help comes from a genuinely caring, wise, and experienced individual, we respond with something like, “things are ok, we are just working through a tough time right now…thanks for thinking of us, but it will be ok.” Given the painful statistics on the challenges in our homes today, too many of us continue to make choices that isolate ourselves instead of bringing together the help we need to effectively deal with the problems we all experience in the home. Receiving help is not a sign of weakness. It is a sign of wisdom and strength. Wise individuals understand that they don’t know everything and could learn a great deal from the experience of others. Genuinely strong and secure individuals are comfortable knowing the value of shared experience and don’t feel a need to prove themselves by going alone in working through a difficult situation. Receiving help is a powerful way to enable another individual to experience the joy of giving. We deny a blessing others will receive when we deny their genuine offer to help when we really need it. There is a powerful emotional bond that is built when we help others in need and we deny that blessing to someone when we refuse their help and we choose to go it alone. Our world continues to grow in complexity, uncertainty, and intensity. The challenges to sustainable achievement in the marketplace and the home are becoming more and more difficult. We should all begin to find comfort in receiving help from others as we continue to build and strengthen our character as Character Creates Opportunity® to build strong relationships and effectively deal with the challenges in our world. What thoughts do you have on the challenges of receiving help from others? Please share a comment below. The holiday season brings about some great opportunities to build and strength our character; With overcrowded shopping malls, homes packed with friends and family that may stay a bit too long, and the work project that keeps nagging at us during our “time off.” I am sure writing about “patience” may be relevant, but might also turn readers off during this “merry” season. So with that assumption, I would like to address the aspects of something just as relevant during the holiday season, Giving and Receiving. Part I of this message will cover Giving and Part II will be about Receiving. Through personal experience, many of us have grown in our understanding of giving and realize that it is truly better to give than to receive. To see the excitement in a child’s eye or the loving embrace of a family member who received a most needed gift demonstrates to all of us how wonderful it is to give. Beyond just gifts during the holidays, the opportunity to give our time, effort, and money to a worthy cause fills us we a great sense of personal warmth and fulfillment. By giving to others and to causes we believe in, we fill a very deep emotional need we all have to belong to something beyond ourselves. The mere act of giving builds a strong emotional bond between us and the recipient or the cause. Moving from the home front to the workplace, the same reality exists. In giving assistance to others delivering on a key project, to give recognition to co-workers, and to provide support to a customer that goes beyond some contractual obligation has the same positive personal return that giving does in our personal life. As we work to build and strengthen our character, I want to encourage all of us to look for opportunities to give, and then “do the right thing” and take action. In addition, we should start as early as we can with children and young adults to consistently show them the value of giving instead of receiving. The earlier we all learn the timeless truth that it is better to give than to receive, the greater impact we can have as we journey through life. Becoming more proactive in giving, in all areas of our lives, is an important aspect of building and strengthening character and our Character Creates Opportunity® to build strong relationships, grow a business, and sustain a high-level of accomplishment. What ways have you found helpful to reinforce that it is better to give than receive? Please share a comment below. For many reading this blog, the rhythm from that song and the music of CCR brings back a few memories of their youth (others maybe saying, “Who in the world is John Fogerty and CCR?”). As we continue to build and strengthen our character, an important topic to address is the need to take action today, rather than putting things off. Let’s face it, we all know the basics of things we should do to strengthen important relationships, improve our health, expand our thinking, or be better positioned to grow in our career. Many times, our excuse for not doing these things is that it is just not the “right time” to take action. “I will go back to school once the kids get a little older”…”I will forgive once the sting of the betrayal subsides a little more”…”I will reach out to that family member once I get through this busy time at work”…”I will get back to exercising in the springtime”. As we have all experienced, many times that “right time” never comes about or when it does, we have a host of other obstacles and “someday never comes.” In the worst of scenarios, that individual or opportunity is gone forever and we missed the opportunity completely. An important aspect of building and strengthening our character is the simple act of taking action to continue moving forward in what we know in our heart is the right direction. Today’s message is not about dropping everything and pursuing that big bold idea that has been weighing on your soul (if that fits you, great, but that is not the intent of this message). Today’s message is more about taking a few small steps forward on what we know is needed. I know I should reach out to a friend who is on my mind…just start it with a quick email or text. I know I should take the first step to mend a troubled family relationship…just pick up the phone and say hello without an agenda. For that desire to exercise, don’t buy expensive equipment or a new gym membership, just start walking around the block and literally take it one step at a time. Some of our biggest opportunities to build and strengthen our character involve taking action in our relationships with others. We all have a tendency to avoid the difficult conversations to repair a troubled relationship. It is never easy and the emotional pain from prior struggles remains with us and makes it even harder to re-engage. I would just like to reinforce that relationships with others will always be intertwined with every endeavor of life. Relationships are worth the effort and it is our character that will create opportunity to improve the relationship. I will leave you with one easy step that has helped me out in the past. Try writing a letter. Yes, an old fashioned hand-written letter. Nobody gets these anymore and I can almost guarantee that an individual in a very troubled relationship will still open a letter and read it in the quiet of his/her own time. Keep it short with a focus on care and concern versus justifying or blaming. Let the letter be a first step to softening defenses and perhaps open a door to reconnect and a path to restoration. If nothing else, you can be at peace knowing you took some action to ensure “someday” finally came. I will be a little bold and take it one step further and much closer to home. Many times the letter does not even need a stamp as the relationship we need to restore is within our home. Taking action, when we know it is needed, is an important aspect of building and strengthening character and our Character Creates Opportunity® to build strong relationships. What ways have you found to reconnect with a challenging relationship? Please share a comment below. As we continue to build and strengthen our character, an important topic to address is the opportunity we have to recognize the efforts of those around us. For many people in a position of leadership in an organization or business, this time of year is filled with opportunities, both formal and informal, to recognize the efforts of our teams and individuals for the past year. There is a great deal of time and planning that leaders put in to written recognition, formal year-end reviews, year-end awards, etc. to ensure the efforts of the team and specific individuals do not go unnoticed. Leaders typically work hard at understanding the unique ways that employees like to receive recognition and what type of awards have significant meaning to the individuals. These recognition efforts are a critical part of building a strong sense of commitment and engagement from team members. As a business leader, I could always count on allocating a fair amount of time and effort into completing year-end reviews and year-end recognition ceremonies as it was such a valuable time to express appreciation and strengthen the team after a long, hard year and begin the preparation for another year ahead. In today’s challenging economic environment, providing recognition for employees and teams who are facing aggressive competitors, significant pricing pressures, and other difficult situations, the recognition from leaders becomes even more critical to sustaining the health of an organization. An important principle that we can anchor our efforts to build and strengthen our character during this time of year is gratefulness. This is an important time for leaders to demonstrate through spoken and written words and specific actions, how grateful they are for the efforts of their teams over the prior year. In my own experience, these were great times to re-engage with team members and reflect on sacrifices and express appreciation when the flow of the business was slowing down a bit and you could more readily enjoy the moment. However, I can also relate to (any maybe you can too) how that smooth and effective recognition plan is executed in the office, gets trampled at home with the craziness of the holidays, traffic in the malls, those last minute gifts, and visits with friends and family. It is an all too common occurrence that we let the “busyness” of our home life put us in a position where we miss the opportunity to express gratefulness to those we care about most. After discussions with a number of people, I can see that I am not alone in this reality. Faced again with the sobering reminder that no accomplishment in the workplace could ever compensate for a failure at home, it is important that we set time aside during the holidays to express gratefulness to the individuals closest to us. I am sure many leaders can specifically cite what type of recognition individuals on their work teams desire…one likes recognition in front of peers, another just wants money, while another would prefer recognition to be sent up the chain of command. However, do we as parents, brothers/sisters, children, husbands/wives, know what specific ways our family members feel loved and appreciated? Is it a nice note or word of encouragement, a special gift, a warm embrace, or just some one on one time? I would encourage all of us to better understand the specific ways our loved ones feel appreciated so we can have a greater impact in our efforts to express our gratefulness. From experience, if we just “wing it,” we can be “way off” on this topic about how others like to be appreciated. So, we should do our homework and ask, or find an interesting way to discover the ways our family members feel loved and appreciated. There are a number of resources we can use and one I have found to be very helpful is Gary Chapman’s New York Times Best Seller, The Five Love Languages. When you and those closest to you take this fun quiz, the answers may surprise you. Either way, you will have the knowledge to be able to maximize your efforts to express your gratefulness to those closest to you as we close out another year. Expressing gratefulness is an important aspect of building and strengthening character and our Character Creates Opportunity® to build strong relationships. What ways have you found to express gratefulness to those around you? Please share a comment below. Over the weekend, I reconnected with a friend who is a leadership consultant and executive coach. He was preparing to meet some clients to discuss the West Point leadership experience and he asked me what were some of the key learnings that I carried with me from West Point into my career in the business world. I thought my email summary in response to his question would be helpful information as we continue our journey to build and strengthen our character. The below is a simple “cut and paste” from my email to him. It is longer than my normal blog posts, but I felt using the entire message made the most sense. At West Point we all lived the “Follow Me” mindset (US Army Infantry motto is “Follow Me”). You have to be willing to stand up and lead when everyone else is scared, tired, confused, and bullets are flying. The simple and courageous act of “modeling the way” by standing up and leading into the fire to accomplish a goal was a day in, day out lesson we all learned by doing and by watching others. The reality is that with the noise, confusion and extreme chaos on a field of battle, the only effective means of communicating and leading a team is to lead by example and that means moving forward into fire to encourage others to move on to the objective with you. In terms of transferring that to corporate life, I think much of the above holds true. People need to see the leader who his leading the way in terms of character, making principle-based decisions, treating people with dignity and respect, and giving their full, committed effort to accomplishing the objectives. In the corporate world, the inevitable atmosphere of “politics”, “perception”, “change management process”, “new fresh ideas from management”, etc. will always be there as a potential hindrance to serving customers and getting things done. However, it has been my experience, that the leader who humbly and persistently sets the example by mere day in, day out actions, will ensure the organization/team achieves their objectives more times than not. All the great memos, corporate communications, and employee briefings are important, but it seemed the daily actions of a leader will always be the element that will rally a team to deliver. Continuously learn and grow (remain teachable). At West Point, there was a tremendous amount of regimented process as you would expect, but inside that regimentation, the situation was always changing and you had to be committed to learn and grow otherwise you would not survive. As a plebe (freshman) you had a constantly changing set of assigned tasks to support your company. As upperclassmen, you were giving new leadership assignments constantly. So there was always new people, new situations, etc. that you had to deal with to accomplish the objectives. In addition, you had a front row seat to constantly observing others in leadership positions so you could be aware of learnings to apply when you were in those positions. Regular Army training as cadets and also when we graduated gave additional learnings. The situation in combat is constantly changing and leaders need to be prepared to adjust plans, techniques etc. to accomplish the mission. Your principles should not change, but the techniques and process need to if you want to survive. You are learning in both success and failure throughout your time at West Point. The environment keeps you humble and humility is critical to remain teachable. In the corporate world, there is a whole discipline on effective “change management process” because it is so difficult for people to understand the need to change, embrace it, and then effectively deliver on the needed change. However, most West Pointers thrive on change as it became a way of life as cadets and Army Officers. The business world is continuing to grow in uncertainty and intensity. Competitive threats emerge so quickly, business plans are meaningless in a matter of months, not years like in the past. Leaders have to be insatiable in the desire to learn, grow and adapt to a very fluid marketplace. Without a humble and proactive willingness to learn and grow, your leadership and your business will die a quick death in today’s hypercompetitive and fast moving global marketplace. The entire West Point experience falls under the umbrella of “service” to our nation, to freedom, and very tactically, service to others in our squads, platoons, and companies. There is so much written today about having a “true north” or a compass to guide personal growth and organizations. Service to our nation was that “true north” at West Point and it solidified the sense that our entire journey of life is about something bigger and greater than ourselves. Tied very directly to that sense of service, was sacrifice. You cannot have one without the other. Sacrifices daily that then ultimately prepared one to give the ultimate sacrifice on the altar of freedom. In the corporate world, there seems to be a more consistent drumbeat from leaders about the aspect of service to their people, teams and customers. However, there is still a strong gravitational pull to “me, my title, my paycheck and my accomplishments” that undergird personal motivation. In some very practical realities, like paying bills, supporting personal responsibilities, etc. those are important, however, when leaders place those things above the call of service to their people, their customers and the cause of the organization they serve, they are missing a critical element to achieving a sustainable, high performing business. As a plebe at West Point, you are told you have only 4 responses for the next 12 months: ‘Yes, sir’; ‘No, sir’; ‘No excuse, sir’ and ‘Sir, I do not understand.’ The response of ‘no excuse, sir’ day in and day out taught you that you are responsible for your actions and the outcomes. Throughout the next 12 months, when an upperclassmen would yell, “why isn’t your room prepared for inspection?”, you learned very quickly not to say, “well, I was tired from competing on the sports field all afternoon, being up all night doing homework, and I just did not have time.” The response you received from the upperclassman to making an excuse like that, ensured you remembered the right answer in the future was, “No excuse, Sir.” When you stood in dinner formation and were asked, ‘Why aren’t your boots shined?’ and you wanted to say something like, “Well, I have been marching all day in dust, dirt and mud, why do you think they are not shined?”, you learned very quickly that the right response, was ‘No excuse, sir.” That experience taught all of us, that we are responsible, no matter what the situation. In today’s world, in corporations or even in everyday life, there seems to be a consistent sense of excuse making or lack of taking personal responsibility. I could list numerous examples in the public sector, private sector, and in our homes across the nation, that we seemed to have become comfortable and emotionally “ok” with playing the “blame game” on our situation instead of taking responsibility for my actions and the results they brought about. What I have carried with me from West Point in my corporate life and frankly, my personal life, as a father and husband, is ‘no excuse, sir’ when things fall short of expectations. As I stated in the other sections above, that mindset keeps your ego in check and keeps you willing to learn. Portage, MI (December 4, 2013) — Harvest Time Partners, Inc., a personal and professional development company, is expanding its market penetration through a partnership with Dr. Toy to accelerate the launch of several new conversation games. Harvest Time Partners’ products will be made available in Dr Toy’s Holiday Gift Guide and The Magic Toy Box. For more information or to discuss additional products and services from Harvest Time Partners, Inc., please visit the company website at www.harvesttimepartners.com, email David at david@harvesttimepartners.com, or call 877-786-4278. Harvest Time Partners, Inc. was created almost 20 years ago to provide support to individuals, companies, and organizations on a variety of topics and subjects encompassing personal and executive development, team building, leadership training, and building a strong marriage and family. Harvest Time Partners provides character-building seminars, workshops, and custom programs designed to increase personal effectiveness, enhance character development, and strengthen the bonds of marriage and family. Harvest Time Partners, Inc. created the award-winning conversation game Abundant Harvest that continues to be embraced by families, schools, and faith-based programs nationwide. For more information, visit www.harvesttimepartners.com. As we continue to build and strengthen our character, an important topic to address is setting goals and making plans to accomplish our goals. For most businesses that desire to exist beyond a few months or a few years, an essential element is setting direction and answering the big questions like “where are we going?” and “how are we going to get there?” Most businesses conduct detailed work on an annual basis to make funding decisions on plans and many conduct routine, long-range planning sessions to account for investing in the organization’s three to five year plans. In reflecting back on the personal and professional choices I made over the years, I see a clear pattern where I have spent an incredible amount of time working to develop the plans for businesses and managing the progress towards those goals. However, I have spent very little time in comparison on setting detailed personal and family goals and specific, measurable steps to achieve them. I have not been completely negligent in setting goals, however, I have been inconsistent in developing the process for setting goals and the detailed plans to achieve them compared to my professional, “on the job” goal setting process. After discussions with a number of people, I can see that I am not alone in this reality. Faced with the sobering reminder that no accomplishment in the workplace could ever compensate for a failure at home, it is important that we develop the rigor around setting personal and family goals and the plans to achieve them. This planning process is a key aspect of building and strengthening our character. It will ensure we are putting forth intentional effort to reach our full potential in the only permanent area of our lives, our family. Personal planning and goal setting is not rocket science. It is a basic blocking and tackling exercise… allocate some time, think things through, make some decisions, and put things on paper. There are numerous helpful tools available for free on the internet or in your local library. There is no shortage of tools to develop a plan. Many of us just simply fall short with the discipline to do it and work the plan. Address the four basic needs of us as humans: (1) Spiritual (2) Physical (3) Mental (4) Social (relationships). Just a few per category that are realistic and “raise the bar” from the prior year. Time: From prior blogs, this section deals with expanding time spent on “important, but not urgent” activities…mostly addressing the four needs above. There are two learnings that I have come away with over the years in making personal plans: (1) Be as specific as possible so you can really “see” what you are striving to achieve and (2) Less is more. Focus on the important stuff and avoid making an endless list of goals that will result in more frustration than motivation. As always, a good planning session should begin with some reflection and decision on answering the big questions around a personal vision or purpose that you are working towards. It is helpful to ensure alignment of next year’s goals with the overall “true north” direction in our lives. In conclusion, I would just reinforce that life continues to grow in complexity and intensity. If we just rely on “winging it” in the critical areas of our own personal growth and important relationships, we will most definitely fall short of our full potential. Being intentional with our personal life-plan is an important aspect of building and strengthening character and our Character Creates Opportunity® to make a positive impact. What have you learned in building a personal life-plan? Please share a comment below. Portage, MI (December 4, 2013) — Harvest Time Partners, Inc., a personal and professional development company, is expanding its market penetration through a partnership with Christian Book Distributors to accelerate the launch of several new conversation games. 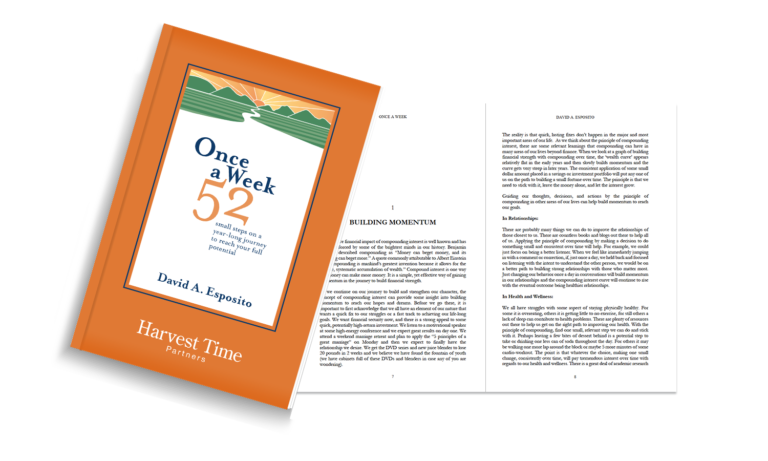 The arrangement will provide Harvest Time Partners with the capability to offer the full line of its patented and award winning conversation games through the Christian Book Distributors’ existing network. CBD will begin marketing the ”revised and updated” version of the award-winning conversation game Abundant Harvest, a one-of-a-kind board game designed to help families and educators open the door to more-productive dialogue and encourage decision making based on principles such as honesty, loyalty, and commitment. Reinforcing the law of the harvest, the game’s primary takeaway is that you will always reap what you sow. In addition, the conversation games Face to FaceTM will also be marketed by CBD. Face to FaceTM is the newest line of conversation games designed to start great conversations on real-life issues, in real-time with friends and families. Face to FaceTM is available in a Kids Edition, Teen Edition, and Dinner Party Edition.